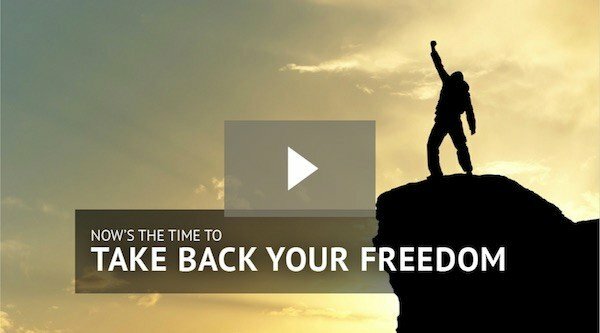 Frustrated by the decline of freedom in your country? Sick of seeing your hard earned dollars fund more wars, more spying, more regulation, and other things that make you less free? Here’s how to legally and strategically fight back. Let’s face it: There is something messed up with the world we’re living in. And it’s all getting worse at an exponential rate. However, let’s be clear – it’s not all doom and gloom. For smart, rational people like you and me who are willing to break free of the status quo, the opportunities to grow wealth, keep more of it, and protect ourselves from out-of-control governments are abundant. The path to freedom and prosperity begins with a clear understanding of the biggest problems we’re up against. And once we’ve identified those problems, we can take simple actions to solve them with practical solutions that make sense no matter what happens. Without a doubt, you’re no longer living in the country you grew up in. The strange thing about the problems we’re experiencing right now is how many times they’ve happened before. It’s as if the bureaucrats are sitting around choosing the worst plays from the pages of history. At Sovereign Man, we routinely draw from historical lessons to highlight this time is not different. What can we learn from previous economic/societal crashes? Throughout the 18th century, for example, France was the greatest superpower in Europe, if not the world. But they became complacent, believing that they had some sort of ‘divine right’ to reign supreme, and that they could be as fiscally irresponsible as they liked. The French government spent money like drunken sailors; they had substantial welfare programs, free hospitals, and grand monuments. They held vast territories overseas, engaged in constant warfare, and even had their own intrusive intelligence service that spied on King and subject alike. Of course, they couldn’t PAY for any of this (sound familiar?). French budget deficits were out of control, and they resorted to going heavily into debt and rapidly debasing their currency. The French economy ultimately failed, bringing with it a 26-year period of hyperinflation, civil war, military conquest, and genocide. Look, history is full of examples, from ancient Mesopotamia to the Soviet Union, which show that whenever societies reach unsustainable levels of resource consumption and allocation, they collapse. How can we apply this to what’s happening today? Right now, the US is consuming TRILLIONS more than it produces, resulting in an unprecedented level of debt $20,000,000,000,000 (that’s twenty trillion). No other country in the history of the world has ever amounted this much debt. And other Western governments are in a similar boat – from the UK to Greece, Spain, France (again) and Italy. This level of spending is unsustainable. And when you look at the raw numbers, there is no sign of improvement anywhere on the horizon. In 2016, the US government’s total operating loss exceeded $1 TRILLION. In other words, they spent $1 trillion MORE than they earned in tax revenue. And the total debt increased by even more– $1.4 trillion. Think about it, though: 2016 was just a normal year. There wasn’t any world war to fight, no major financial crisis to defend against, no bank bailout to save the system, no massive infrastructure project. It was just business as usual… just another normal year. And yet, even in a normal year devoid of anything extraordinary, THEY STILL LOST $1 TRILLION. Look, this isn’t just theory or conjecture. These are their own figures. Remember, we’ve seen this time and time again throughout history. The world always has a dominant superpower. Empires rise, they peak, they decline, and they collapse. The US is rapidly declining and heading toward collapse. So how much time is left on the proverbial countdown clock? And what will they do to try to kick the can down the road a bit longer? There isn’t a clear answer. What is clear, is something is going to give. The cracks are abundant in the the current system, and no amount of cement can cure them. A tiny elite has total control of the money supply. They wield intrusive spy networks and weapons of mass destruction. They can confiscate the wealth of citizens in their sole discretion. They can indebt unborn generations. And just about everyone knows it. Given that the majority of Western governments borrow money just to pay interest on money they’ve already borrowed, it’s obvious the current game is almost finished. When it ends, there will be a reset… potentially a tumultuous one. However, we do know a big reset is on the way, because this is not a consequence-free environment. And if history continues to repeat itself, our government will take drastic measures to protect the status quo. Your retirement accounts are ripe for the picking…most likely via the forced purchase of “safe” government bonds, which began several years ago while Barack Obama was still in the White House with his MyRA plan. Meanwhile, governments such as Ireland and Australia have already begun increasing taxes on retirement accounts. Civil liberties will continue to be infringed upon…from telling us what we can and cannot eat, to charging people for collecting rain water or producing raw milk, to increasing checkpoints and even more draconian restrictions. Dissent will not be tolerated. We’ve seen fear and intimidation policing steadily rising in North America, Europe, and most of the West. It’s very unlikely to cease anytime soon. And with the ability to freeze citizens out of their savings at their own discretion (among other things), the government will continue to tighten its grip. These are all possibilities, many of which have already begun, and with them come many more. But as we’ve discussed…along with all the bad comes incredible opportunity. And that trend is the RISE of humanity. Human beings are fundamentally tool creators. We take problems and turn them into opportunities. Sovereign Man is all about helping you to create a life where you will be OK and even THRIVE no matter what happens. We’ll discuss exactly how you can adapt and overcome with practical solutions in just a moment. It’s critical to point out the world is not coming to an end. So how can you protect your family’s liberty and prosperity with solutions that make sense no matter what happens? This saying is at the core of what we do at Sovereign Man. Simply, it means don’t bet your whole life and future on one single country. You don’t have to live, work, bank, invest, save for retirement, etc., all in the same country of your citizenship. The world is a big place, and frankly, there are a lot better and safer places to store your savings than in an insolvent Western bank. We utilize international diversification to help you make more money, keep more of it, and free yourself from out of control governments. First and foremost, how do you fully protect your family’s liberty, wealth, and future? These are the solutions we provide at Sovereign Man. If your country is bankrupt and starts imposing even more draconian financial controls and other restrictions, you’ll be OK since a portion of your savings and investments will be overseas. You’ll even have an alternative residency established in a thriving place, which could yield you a second passport down the line. And if your government starts making a grab for retirement savings (which is exactly what’s beginning to happen in some parts of the world), your funds will be safe and secure in much more lucrative investments overseas. These solutions will not only help you secure our liberty and assets, but also help you thrive and prosper. From offshore banking and gold storage to second passports, frontier investing, and self-directed IRAs, we’ll show you how to secure your liberty and prosperity with a rational, intelligent strategy. Multiple times every week, we help over 100,000 Sovereign Man subscribers who are taking their family's liberty and prosperity into their own hands with our free publication, Notes From The Field. Activate your free subscription today, and get fresh intelligence delivered securely to your inbox as we travel the world discovering the biggest opportunities available to smart, enterprising individuals such as yourself.